JULY 14: VIGIL DIVINE LITURGY – 4:00 PM (SN); JULY 15: DIVINE LITURGY (SCM)- 10:00 AM. There are 2 Gospel readings on this Sunday. The first Gospel Reading is Matthew 14:14-22, The Feeding of the 5000, in which the passage of story concerns Christ’s feeding five thousand with five loaves and two fishes. Breaking bread together is a communal and sacramental act that echoes through the scriptures. Sharing a meal is a primary means of creating and maintaining community. When Christians gather to break bread together, we remember and repeat Jesus’ words and actions. In this sacred meal Christ satisfies our deepest hungers, heals our brokenness, binds us together as if one body, and strengthens us for service in the world. On this Sunday, the Church venerates the Holy Fathers of the Ecumenical Councils because Christ has established them as “lights upon the earth,” guiding us to the true Faith. “Adorned with the robe of truth,” the doctrine of the Fathers, based upon the preaching of the Apostles, has established one faith for the Church. 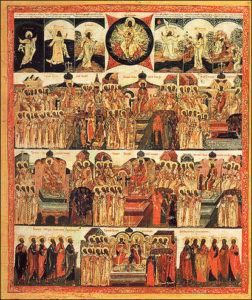 The Ecumenical Councils, are the highest authority in the Church. Such Councils, guided by the grace of the Holy Spirit, and accepted by the Church, are infallible. On July 15th we also commemorate St. Vladimir the Great, Equal to the Apostles. He was a devout pagan in his early life. He was a great conqueror who had many wives and erected many pagan statues in the lands that he ruled over. Upon finding out that other faiths existed beyond his own paganism, he decided to send his envoys out into the world to find out what was true faith on earth. His envoys met with Muslims, Jews and Catholics, but everything changed, however, when the envoys arrived in Constantinople. Upon attending Divine Liturgy in Hagia Sophia, the envoys said, “We no longer knew whether we were in heaven or on earth.” Taking the word of his envoys, St. Vladimir had himself and his nation baptized into the Orthodox Church. St. Vladimir changed completely after his baptism. He destroyed all the pagan statues that stood in Kievan Rus’, and replaced them with churches. He also attempted to live in peace with his neighbors and had only one wife.